Background: Smartphones have evolved rapidly in the medical profession, and can now produce high quality medical images, providing a quick and simple method of image distribution. This has the potential to improve clinical care of patients, but comes with specific ethical and medico-legal considerations that include issues of confidentiality, privacy and policy control. Aim: To quantify the use, distribution and storage of medical images taken using smartphones by clinicians, along with their perceptions regarding policies, practices and patient care. Methods: All clinicians and medical students employed or undergoing rotation at Peninsula Health during March 2012 were asked to participate in a de-identified, 36 item, online survey administered by SurveyMonkey. The survey questioned respondent’s demographics, and issues surrounding the recording and dissemination of medical images using smartphones. Results: 134 responses were received. Most respondents were from the surgical discipline, followed by medicine, then emergency. Sixty five per cent admitted to taking medical images on their smartphones, yet no consent was obtained in almost a quarter (24%). When consent was taken, it was predominantly verbal, but only documented 23% of the time. Of those who took medical images, 64% stored them personally and 82% shared them with someone else, mostly for input from another clinician. Forty three per cent were aware that an institutional policy existed, but only 28% had read the policy. Clinicians’ smartphone photography practices are an important issue, and research in this nascent area is emerging in the literature1–5. Technological advances have resulted in the ubiquitous presence of digital cameras in hospitals worldwide, as part of a mobile phone or in the form of a personal digital camera. Such readily available devices may lead to casual capture and accumulation of patient images, and may detract from the concept of images as elements of a patient’s medical record. Photography assists clinicians to objectively evaluate and document medical conditions for analytical purposes, while at the same time facilitating important “before and after” comparisons. The ultimate aim of capturing, storing and sharing clinical photographs should be to improve the outcome for the individual patient. Photography is a useful adjunctive means of accomplishing this goal. As well as being integral to medical practice, clinical photography is also essential to our role as mentors and teachers. Whether teaching young colleagues at the bedside or via peer reviewed journal publications and clinical presentations, photography plays an important role in illustrating particularly interesting and rare cases to the wider medical community. Technology advances at an ever-increasing rate within the health sector, bringing with it a range of ethical and legal dilemmas6. The ownership of medical images taken in this environment is one such dilemma and is different to those of other documents because of the sensitive nature and duty of confidentiality assumed by the patient when the image is taken. Taking an image does not necessarily mean ownership of the image, for instance in the public sector these photographs may become both the property and responsibility of the hospital8. When clinical photographs are taken, patients are often vulnerable and undignified; our performance as clinicians must be transparent, honest, legal and auditable at all times6, 7. Doctors have always had an obligation to maintain confidentiality in relation to patient information. A breach of privacy or confidentiality can lead to a complaint of professional misconduct, and potential disciplinary proceedings before medical boards and authorities8. In addition, clinical decision-making is influenced by the information contained within the image, making the image an important part of the patient clinical record. The image should be stored in the medical record, be archived and available to the patient through ‘freedom of information’ legislation. A medical practitioner can only use or disclose health information for the purpose for which it was collected, unless the individual’s consent has been obtained – and not doing so may have serious consequences9. Patients also have the right to withdraw their consent at anytime in the future. The loss or misplacement of a portable device containing unsecured medical images present privacy risks to individuals and organisations. Recent healthcare legislative changes to the Australian privacy act took effect in March 2014. Under these changes to federal law, health professionals with unsecured patient images on their smart devices will face fines up to $340,000 and institutions up to $1,700,000 for a breach of patient privacy9. Australian regulations stipulate that sensitive data, such as information that constitutes part of the medical record, cannot be transferred across Australian borders. This issue of trans-border security and data flow has not, until recent times, been addressed by suitable large-scale data storage facilities within Australia (for example, Amazon web services10 offer storage that can only be accessible within particular countries). Whether commercial operations will satisfy Australian privacy standards is yet to be tested. The core policies and principles of using smartphones are no different to using a film camera or stand-alone digital camera. Most health care organisations (including ours) have policies that address the safe collection of such images. However these policies now need to address electronic issues such as evidence of signed informed consent, delineation of specific intended use(s), strong encryption of transmitted data with authenticated access, and secure storage thereof11. Smartphones have evolved to the point that they now routinely integrate a digital camera of an acceptable clinical quality capable of capturing medical images. Multimedia messaging (MMS), email services, and social networking provides a quick and simple method of media distribution. This rapid evolution of technology creates the potential to enhance the clinical care of patients within a hospital environment, but also brings with it issues of confidentiality, privacy and policy control2, 4–6, 12. Their uptake by physicians in a clinical setting has evolved at a rapid rate over the past decade13 to the point that most clinicians now carry a camera embedded device in their pocket when undertaking clinical work. However, the prevalence of one of the simplest operations available on these devices, namely the photographic function, has been poorly described or quantified. The aim of this study is to quantify the use, storage and dissemination of medical images taken on smartphones in a clinical environment, and to assess perceptions regarding policies, practice and patient care. All clinicians and medical students employed or undergoing rotation at an outer metropolitan hospital in Melbourne, Australia during March 2012 (n= 409) were sent an email inviting them to participate in a de-identified 34 item online survey administered by SurveyMonkey(™)14. The survey (Figure 2) was piloted on a number of medical staff whose results were not included in the final analysis. The survey questioned respondent’s demographics and medical speciality as well as issues surrounding the recording and dissemination of medical images using smartphones. Two email reminders were sent over a one-month period. The HREC committee of Peninsula Health reviewed the research methodology. Because of the sensitivity of the nature of this study, full committee ethical approval was required and approval granted for this study (Peninsula Health HREC/12/PH/26). 134 responses (32%) were received. 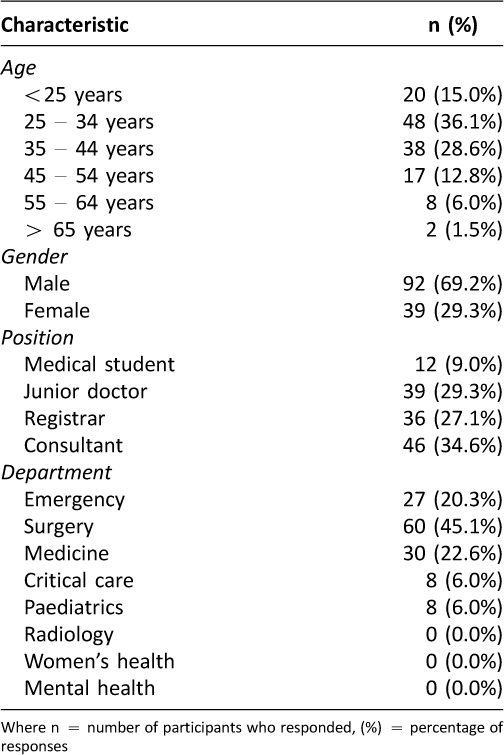 The majority of the respondents were from the surgical discipline (45%), followed by medicine (22%), emergency medicine (20%), critical care (7%) and paediatrics (6%). Consultants were the highest respondents (35%), followed by registrars (27%). No responses were received from women’s health, mental health or radiology. All but one respondent (99%) owned a mobile phone equipped with a camera, with 89% of smartphone owners having Internet connectivity. Less than half of smartphones were password protected with PIN control. Almost two-thirds (65%) of respondents acknowledged taking medically sensitive images on a personal device, yet in nearly a quarter of cases (24%) no consent at all was gathered. For those that did obtain consent, only 7% gained written consent, whilst 78% failed to document the procedure in the patient record. Images were kept by 63% of clinicians, either on the device itself (64%), on another storage device (12%) or on both the device and another storage device (21%). Four per cent of clinicians stored their images both locally and on Internet “cloud” based storage. The most common method used to share an image was physically on the device itself, with non-secure delivery techniques including multimedia-messaging service (MMS), email, and instant messaging prevalent. One respondent admitted to uploading these medical images to a social networking site (Facebook or Twitter). Only 43% of respondents were aware that an institutional policy existed regarding medical image photography, and of those respondents, only 28% recalled reading such a policy. Perceptions regarding ownership of captured medical images varied, however less than half of the respondents accurately understood that the employer owned the image i.e. the hospital. Most thought (incorrectly) that the patient was the owner of the image. Respondents often stated multiple reasons for image capture which included ‘input from another clinician’, ‘education or training purposes’, ‘usage in presentations’, to ‘show someone outside the hospital’ or simply due to the fact they found something interesting or unusual about the case. The vast majority (90%) of clinicians felt the use of clinical photography using smartphone technology had a positive effect on patient care. Medical photography is widely accepted as an important part of contemporary medical practice with benefits that are well recognised15. Technology now has evolved to a point where personal devices have the ability to not only capture these images, but also easily store and distribute them. Ultimately their primary function in a professional environment is to deliver quality clinical care to patients in a timely and resource friendly manner. Our collective aim should be to bridge the divide between legislation, local policy and best practice. This report highlights the growing use of personal devices within the clinical environment to assist with the delivery of quality patient care in an increasingly globalised healthcare system. 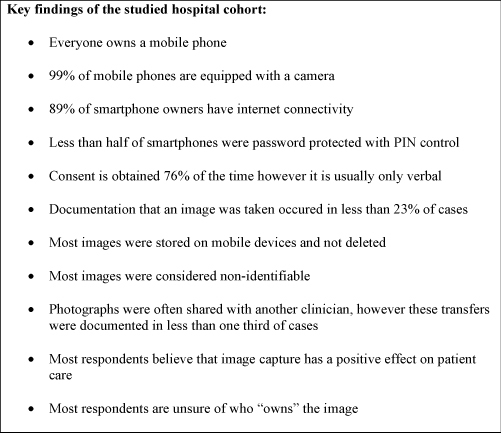 This study supports the notion that although clinical photography is commonly used in clinical practice16–18, there is a general lack of understanding regarding policy, image ownership, professional obligation and risks associated with the use of smartphone technology. The results of this study seem compelling (Figure 1), however, because of the small sample size and single institutional basis it is important not to generalize these findings to the wider health care community. Further multicentre studies will help to establish whether these obvious and important findings are consistent across a larger sample size. There has been much debate regarding the ethics and legality of taking clinical photographs using personal cameras, whether these be part of a mobile telephone or the user’s own digital camera4–6, 18–21. In practice, it appears that these considerations impact little on clinicians, who most commonly use a personal digital camera5. A clinical photograph may be, and is likely to be considered part of a patient’s medical record, even when stored electronically. Doctors should be aware of the applicable health records legislation within the state in which they practice, as they may be obligated to hold patient records — in most cases, for seven years6. In addition, patients may be able to access their own clinical photographs in the context of freedom of information legislation. This paper highlights privacy issues, poor recognition of hospital policy, lack of consent or documentation, and an overall ignorance to legislative and hospital guidelines. Although this study did not explore patient perceptions, there is evidence to confirm most patients are happy for images to be taken by treating clinicians but unhappy for clinicians involved directly in their care to store their clinical images stored on personal devices22. We now find ourselves on the brink of new Australian legislative requirements23 that will force healthcare professionals to change what are already entrenched practices. Medical practitioners and their employers should appreciate that this area of law is a dynamic one and aim to stay abreast of changes in legislation when drafting their own policies and practices6. Users of smartphone cameras for clinical purposes require education into their responsibility regarding patient privacy and photography. The core policies and principles are no different to using a film camera or stand-alone digital camera and in many organisations almost certainly already exist. The major difference using a smartphone camera is the ease of making a clinical photograph publicly available, which presents more of an education issue than a policy issue. Creation of hospital workflows that allow the use of new technology such as smartphones in a safe and compliant manner. Our organisation has begun processes to develop new procedural policy and education that will ensure the safe capturing of medical images a standard practice. The Research and Ethics committee of the Peninsula Health care network Australia approved this study. David Hunter-Smith holds shares in the smartphone application company Picsafe Medi Pty Ltd.
1. Lewis N. Healthcare mobile devices forcast to gain 7%. Information Week [Internet]. 2010, Feb 7. Available from: http://www.informationweek.com/mobile/healthcare-mobile-devices-forecast-to-gain-7-/d/d-id/1090464? 2. Fernando J. Clinical software on personal mobile devices needs regulation. Med J Aust. 2012;196(7):437. 4. Burns K, Belton S. “Click first, care second” photography. Med J Aust. 2012;197(5):265. 5. Berle I. Clinical photography and patients rights: the need for orthopraxy. J Med Ethics. 2008;34(2):89–92. 6. Mahar PD, Foley PA, Sheed-Finck A, Baker CS. Legal considerations of consent and privacy in the context of clinical photography in Australian medical practice. Med J Aust. 2013;198(1):48–9. 7. Australian Medical Council. Good medical practice: A code conduct for doctors in Australia. Canberra: Australian Medical Council, July 2009. 8. Gorton M, Tobin I. Making complaints against health practitioners – are you protected? Russell Kennedy Client Bulletin. 2012. 9. Privacy Amendment (Enhancing Privacy Protection) Act 2012, S1 – Australian Privacy Principles. 10. What’s new: Amazon CloudFront adds GeoRestriction feature: Amazon Web Services, Inc.; 2014. Available from: http://aws.amazon.com/about-aws/whats-new/2013/12/18/amazon-cloudfront-adds-geo-restriction-feature/. 11. McDonald K. Cloud-based solution for mobile clinical photography. Pulse IT. 2012:42–3. 12. Chretien KC, Greysen SR, Chretien JP, Kind T. Online posting of unprofessional content by medical students. JAMA. 2009;302(12):1309–15. 13. Franko OI, Tirrell TF. Smartphone app use among medical providers in ACGME training programs. J Med Syst. 2012;36(5):3135–9. 14. SurveyMonkey. Palo Alto, California, USA. Available from: http://www.surveymonkey.com. 15. Cleland H, Ross R, Kirk M, Hunter-Smith DJ. Clinical photography: Surgeons need to get smart. ANZ J of Surg. 2013;83:600–1. 16. Farshidi D, Craft N, Ochoa MT. Mobile teledermatology: as doctors and patients are increasingly mobile, technology keeps us connected. Skinmed. 2011;9(4):231–8. 17. Piek J, Hebecker R, Schuteze M, Sola S, Mann S, Buchholz K. Image transfer by mobile phones in neurosurgery. Zentralbl Neurochir. 2006;67(4):193–6. 18. Burns K, Belton S. Clinicians and their cameras: policy, ethics and practice in an Australian tertiary hospital. Aust Health Rev. 2013;37(4):437–41. 19. Harty-Golder B. Photos and “photo cell phones” prompt new policies. MLO Med Lab Obs. 2004;36(3):40. 20. Seigmund CJ, Niamat J, Avery CM. Photographic documentation with a mobile phone camera. Br J Oral Maxillofac Surg. 2008;46(2):109. 21. Derbyshire SW, Burgess A. Use of mobile phones in hospitals. BMJ. 2006;333(7572):767–8. 22. Qureshi A, JC K. Patient knowledge and attitidue towards information technology and teledermatology: some tentative findings. Telemed J E Health. 2003;9(3):259–64. 23. Earles M. New reform to Australia’s privacy laws. Vicdoc. Feb 2013:14–5. Very interesting topic. We’re passionate about the way mobile technology is being used among healthcare professionals around the world and the possibilities of a crowdsourced photo-sharing network can do for this community. We’ll share it within our networks. Great work! And they reference Privacy Amendment (Enhancing Privacy Protection) Act 2012. Where exactly in the Act does it talk about fines like that? Can you provide a more precise reference please?